This homemade costume for men entered our 2017 Halloween Costume Contest. I have been making my own Halloween costumes for the last 25 years. I try to make something new every year. Every year now friends and family are waiting to see what the new costume will be. I was running out of original ideas, that is how I found your site, I now scour the computer looking for ideas. I wanted to do something I have never seen and I think I've seen it all. I wanted to try to keep to the Halloween theme, like vampires, monsters, witches, pumpkins, bats, and ghosts. So I got the idea, I am going to be a whole Haunted House, I never seen that before and a I could incorporate everything Halloween into one costume. I had noticed a few years ago when trick or treating with the family, a house that had skeletons fighting in the window. I now know it was video from Atmosfearfx. I thought that is perfect for my costume. I ordered a couple of small projectors and video sample for a demo. When I knew the video system was going to work, I started making my house. I went to a local furniture store and got lots of cardboard boxes and bought some glue sticks. I then looked online for haunted house images and came up with a design in my head. It had to be a wearable size to get through doors and big enough to show the videos in the front two windows. The windows are over-sized to show a good image. I started cutting and gluing and built the basic house structure. I then cut scrap pine wood on the table saw to frame out the windows and trim. The tedious part was the roof. I cut 900 large craft sticks into 1800 shingles and glued them on one by one. The wood trim was another 200 pieces. I then cut cardboard siding in 1” strips and glued it on. By this time I was running out of time to get it done, I was going to make little decorated rooms on the first floor, but time did not permit. I made the rooms only 1 1/2” deep and printed pictures of mansion rooms for backdrops. I then made railings out of bamboo skewers, porch post dowels, paper mache pumpkins and other decorations. The chimney I made by using dry wall compound on the cardboard and cutting in the bricks with a craft stick. I painted everything and added some ivy on the chimney with blended craft moss. You look out of widows watch, which has a mirrored film that you can see out of, but people cant see in. The other three windows are a metallic fabric that lets air in. The costume is on casters with pvc legs glued into the corners of the house. There are dowel handles on the inside that allows you to pick up the whole costume to go up stairs or over obstacles. The costume was actually quite maneuverable. The widows watch has a low rpm motor in the top where I attached some music wire with bats so they can circle. 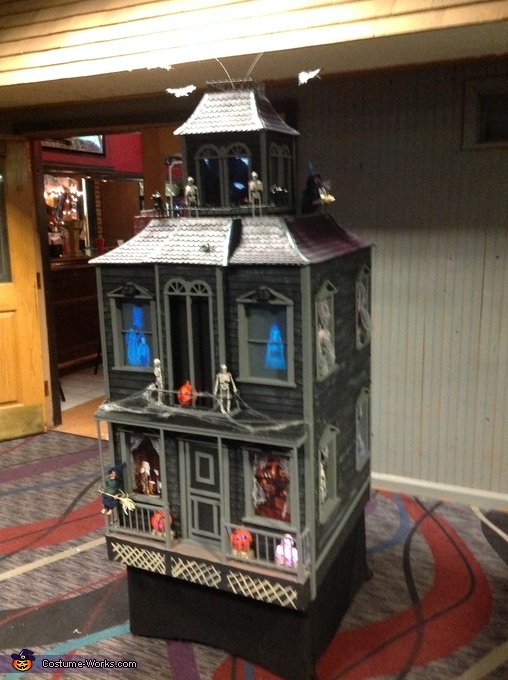 I also included a Bluetooth speaker I had, with my Ipad and played haunted house sounds. I wanted to add more decorations, but time ran out. Going out to a Halloween party was exciting. This was one of my most tedious costumes but was well worth it. People were exasperated when they saw it, most couldn't believe it was a costume and thought I was crazy. People stood in amazement looking at the costume. One guy was studying it closely, so I questioned him, he was a finish carpenter and couldn't believe the amount of detail. That made me feel really good because I am never 100% pleased with my work, always rushing. The costume cost about $400, mostly for the hardware I had to buy, video dvds, projectors, power supplies, projector screen material, paint and lots of glue sticks. That is amazing! I made my son a haunted house costume 3 years ago but this goes way beyond what I did with a refrigerator box and some paint. (He was only 8 so his had to be on a wagon.) It is more like what I would have tried to do if I'd had more than $30 and the talent to do all that detail work. We used mostly recycled stuff. I did think about a projector but we just didn't have the money I love the way that you used it. I had hoped to do rotating bats but the thing we had didn't work so I put them on thin wire and they wiggled around. :) We did have a spooky sound and a door that opened (he was a vampire inside) so that the kids could trick or treat at his costume. Thank you for bringing back some fond memories.